We hoped you liked reading Analyzing the Impact of Early At Bat Strikeouts on Overall Offensive Production by Tyler Branneky! What a great question to dig into. I think your exactly right about how an early count strikeout is viewed. From my limited playing experience, the early strikeout had a big impact to my confidence. I was very surprised at the results. I gotta believe the sample selected influenced the correlation with the advanced metrics. There are multiple ways to become a top 50 wRC+ guy and all the players in the sample have found ways to be highly productive. I hope that you dig further into this question. One thing this made me think of was something of a regression, where the number of pitches and the result of an earlier at bat affect the outcome of a future at bat. 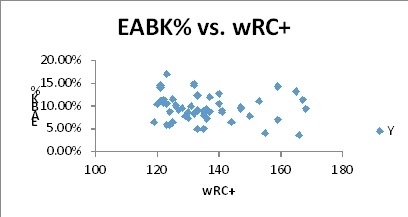 A possible reason for the lack of correlation between the EABK% and BB% could be the frequency that hitters put a ball into play early in the count. 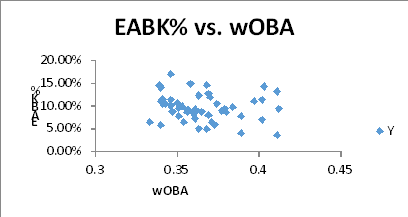 Hitters who frequently put the ball into play early in the count would see a reduction in both their EABK% and their BB% (this sounds a lot like Altuve’s profile, for example).